$7,400.00 Gold Star Medal of a Hero of the Soviet Union, #2558, awarded to an 18-year-old Steppe Front private for heroic actions during the forced crossing of the Dnieper. He volunteered for an extremely dangerous reconnaissance mission and single- handedly installed an underwater cable across the Dnieper thus establishing a vital link with the bridgehead. He also repaired the submerged portion of the cable after it was severed in a Luftwaffe air raid. The medal is in very fine condition, above the average for a wartime Hero Star. Comes with a copy of the award recommendation from the Russian military archives and as well as articles about the recipient in Soviet publications. $850.00 Large Certificate for the title of Hero of the Soviet Union, awarded to a Combat Engineer Private for extraordinary bravery and fortitude shown while building bridges under enemy fire. Comes complete with the original hard folder. In excellent condition. $450.00 Order Booklet (Main Award Document) of Hero of the Soviet Union Infantry Corporal. He was awarded with a Title of Hero for being one of the first to reach the enemy-held bank during the forced crossing of the Dnieper and defending the bridgehead against numerous Nazi counterattacks. The booklet contains entries for his Hero Star #4382, Order of Lenin issued with it, and Medal for Valor. The document is in very good to excellent condition. $600.00 Hero of the Soviet Union Photo ID (aka "Small Certificate" for the Title of Hero), 1946 issue to a WW2 Rifle Regiment Commander. He received the Title of Hero of the Soviet Union for the storming of Mount Sapun (Sapun-gora), the key height near Sevastopol, during the liberation of Crimea in May 1944. 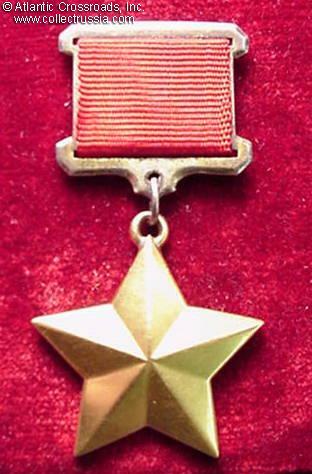 The recipient, a Civil War veteran, was very highly decorated for combat in WW2: beside the Hero Star, he also earned several other decorations including Orders of Suvorov 3rd cl. and Alexander Nevsky. The document is in very good condition. $235.00 Complete and Original 1941 Heroes of the Air War over Leningrad portrait portfolio. $50.00 Lithograph portrait Fighter ace Trofim Litvinenko, Hero of the Soviet Union. He shot down 23 enemy airplanes on the Leningrad Front, circa 1944. $30.00 "Heroes of the Blazing Years", Volume 7, C. 1984, Moscow. Hard-bound, 686 pages, Russian text. The book contains biographies of nearly 100 Heroes of the Soviet Union who were born in Moscow or Moscow Region. This scarce out of print publication can be an excellent supplement to the standard two-volume catalog "Heroes of the Soviet Union". $60.00 "For Courage and Valor", I. Gorobets et al, C. 1984, Russian-language hard cover, 455 pp. The book contains biographical essays about 180 Heroes of the Soviet Union who were born in Poltava or Poltava Region, accompanied by their photos. Includes convenient alphabetical index at the end. This scarce out-of-print reference is a great supplement to the standard reference guide on Heroes of the Soviet Union or information that can be found online.